New market research report “Nuclear Moisture Separator Reheaters Market - Global Market Size, Pricing Analysis, Regional Analysis and Competitive Landscape to 2020” prepared by GlobalData has been recently published by Market Publishers Ltd. The report reveals that currently, 56 new nuclear reactors are under construction from pole to pole and are expected to come online during the forecast period, which indicates growth in demand for nuclear moisture separator reheaters globally. Demand from new and existing nuclear power stations is set to drive the moisture separator reheater market. Currently, 56 new nuclear reactors are under construction from pole to pole and are expected to come online during the forecast period, which indicates growth in demand for nuclear moisture separator reheaters globally. There will also be demand for moisture separator reheaters in the replacement market as many of the existing reactors will require their replacement once they complete 25-30 years of operational life. In the long-run, most of the demand for moisture separator reheaters will be primarily due to new reactors in the nuclear power producing countries as well as the development potential in emerging nuclear countries. The European and Asia Pacific regions are expected to generate strong demand for nuclear moisture separator reheaters through 2020. Europe is expected to show the highest demand for 560 moisture separator reheater units, followed by the Asia Pacific with 288 units, and North America with 244 units. The increased demand from these regions will result in the sustained growth of the nuclear moisture separator reheater market. New market research report “Nuclear Moisture Separator Reheaters Market - Global Market Size, Pricing Analysis, Regional Analysis and Competitive Landscape to 2020” prepared by GlobalData has been recently published by Market Publishers Ltd.
detailed information on key industry players. Major companies mentioned in the report include Balcke Durr GmbH, Mitsubishi Heavy Industries, Hitachi, Ltd, Bharat Heavy Electricals Limited, Holtec International, Alstom Power, Westinghouse Electric Company, LLC, Thermal Engineering International (USA) Inc., The Babcock & Wilcox Company, GE Energy and Iberdrola Ingenieria y Construccion, S.A.U. 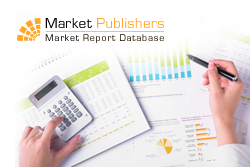 More new market research reports by the publisher can be found at GlobalData page.